Norfolk-based contract farmer and potato grower B&C Farming purchased a bespoke potato grading line from Peal Engineering 29 years ago. 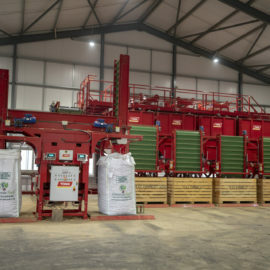 With advances in equipment automation and efficiency offering some significant savings in labour and costs, when the time came for B&C Farming to upgrade their existing line, managing director Tony Bambridge approached Tong Engineering to design a custom-built seed potato grading facility with all the company’s current and future requirements in mind. B&C Farming, based in Marsham, Norfolk, work with Greenvale AP and McCain to supply seed potatoes direct to growers. Operating a ‘just in time’ delivery system using the companies own lorries, B&C Farming supply seed at planting. A new grading facility would ensure they can continue to produce more, higher-quality seed potatoes in line with ongoing contract demands. The new grading line at B&C Farming also features Tong’s industry-leading box filler the Midi EasyFill, which gently transfers graded and sorted crop back into boxes for storage. In addition, a series of Tong vertical lowerator box fillers are used for high capacity yet gentle box filling. 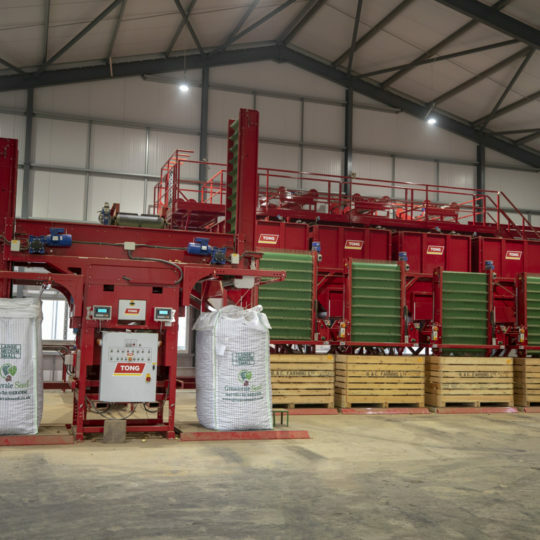 “When crop comes out of store and is ready for delivery to customers in March, Tong’s UniFill big bag filler comes into its own as crop is tipped onto a second line where it passes through final inspection and is gently filled into 1 or 1.25 ton bags,” explains Tony.